At any given moment I’m an arm’s reach from my cellphone. It’s not just a phone, it’s a laptop, a GPS, and – when my daughter tells it “I love you” – a female voice replies with almost lifelike bashfulness “You are sweet.” Frankly, I’m frightened. That’s why, when I receive mail – real mail, bundled up in cardboard and clear packing tape – I get so excited. Cardboard boxes don’t talk back. The postage stamp doesn’t double as a GPS when I’m fifteen minutes late for a show. It simply sits there, until I open it. The best possible mystery. The way it should be. This week, Global Table Adventure received a package from my mom which tickled my funny bone in the most delightful way. This is reason #3,568,999 why my mom is so special. Ava, who was as curious as I was, tore out the sheets of crinkly tissue paper to reveal a heavy duty heart-shaped bowl, small pitcher, and a covered sugar bowl. The bottom of each bowl read “Handmade in Poland.” Mom found them at a rummage sale, just in time for our feast. I instantly knew the heart bowl was the perfect hug-shape for a stack of butter and onion-fried Peirogi. 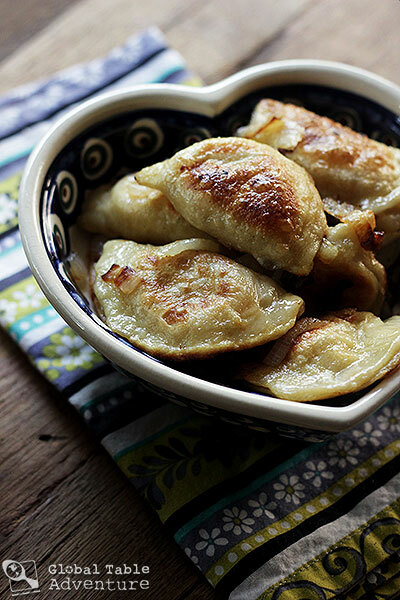 These central and eastern European dumplings are stuffed with anything from potatoes and cheese to sauerkraut or even prunes (the prunes being a sweet, dessert-style peirogi). These little bundles of comfort are so popular, you can even find them in American supermarkets. I’ve purchased them many times myself. Our version uses some cheddar, but for even more authenticity go for straight farmer’s cheese. Still, despite the convenience, I wanted to try my hand at making them. We’re living in the rise of the cellphone “friend.” It’s time to push up our sleeves, slow down, and roll out some dough with our children. Now, there’s a famous Polish saying “Piękna miska jeść nie daje,” which means a beautifully decorated plate won’t feed anyone. I’m not so sure. Because, sometimes the plate inspires me to make something special to put in it. Adapted from The Best International Recipe. 4-5 Tbsp water, or as needed to bring the dough together. Just look at this mysterious architecture. Stunning. At least there are windows. Twierdza Srebrna Góra. Photo by Ksiestwo. 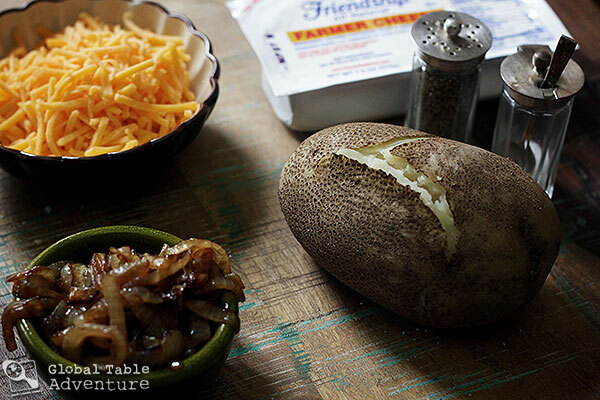 Find a special kitchen spot and get to work… Boil and skin a russet potato, then mash with the cheesy, oniony goodness. Don’t forget the salt and pepper. Cover and refrigerate until cool. (Once the filling is chilled, it will be firmer and easier to work with). 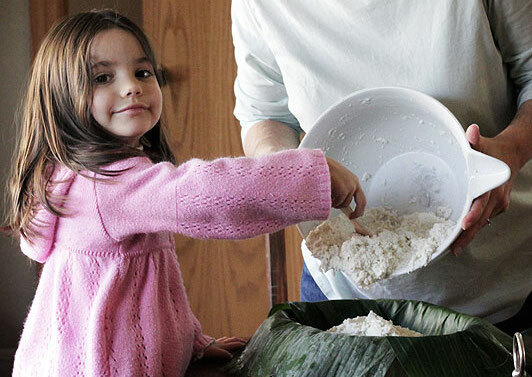 Meanwhile, prepare the dough by pulsing everything together in a food processor, or by mixing by hand in a bowl. 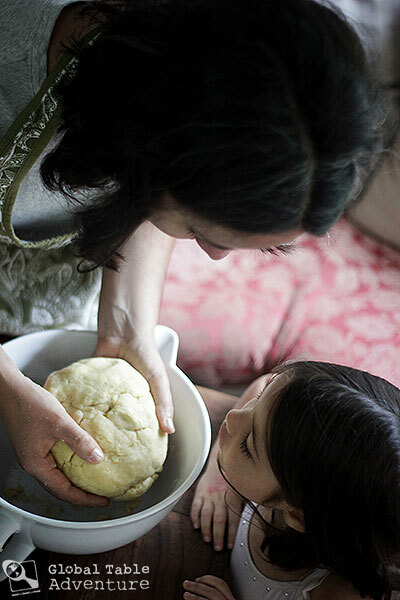 Stream in just enough water to get it to pull together into a soft, workable dough. Wrap in saran and let rest about thirty minutes. This will let the gluten relax and make the dough easier to work with. While it’s resting, go dance a little dance. Polish, preferably. Traditional Polish Dancing. 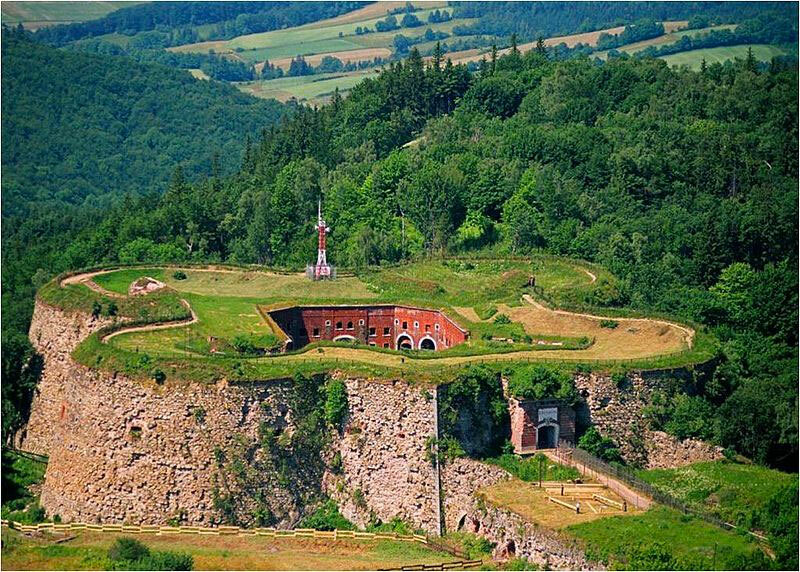 Photo by Nevit Dilmen. Once you’ve danced enough to work up a sturdy kind of hunger… cut circles and top with a dollop of potato filling. Pull the dough around the filling and pinch together at the top, then work around the edges. You might find it easier to work with less filling at first, but try to gradually work up to nice, plump pierogi. The dough should be elastic enough to do so. You can either freeze them or boil right away. Simply cook until floating and the dough is cooked through – this only took about 3-5 minutes for me, but will depend on how thick your roll out your dough. Drain and brown in butter. You might also enjoy with caramelized onions or even a dollop of sour cream. Trying new foods… it’s a process. Sending you much love today, and always. 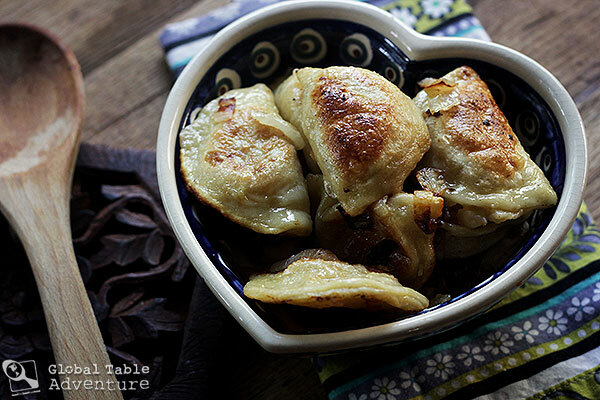 These central and eastern European dumplings are stuffed with anything from potatoes and cheese to sauerkraut or even prunes (the prunes being a sweet, dessert-style peirogi). These little bundles of comfort are so popular, you can even find them in American supermarkets. I’ve purchased them many times myself. Our version uses some cheddar, but for even more authenticity go for straight farmer’s cheese. Still, despite the convenience, I wanted to try my hand at making them. We’re living in the rise of the cellphone “friend.” It’s time to push up our sleeves, slow down, and roll out some dough with our children. 4-5 Tbsp water , or as needed to bring the dough together. Boil and skin a russet potato, then mash with the cheesy, oniony goodness. Don’t forget the salt and pepper. Cover and refrigerate until cool. (Once the filling is chilled, it will be firmer and easier to work with). 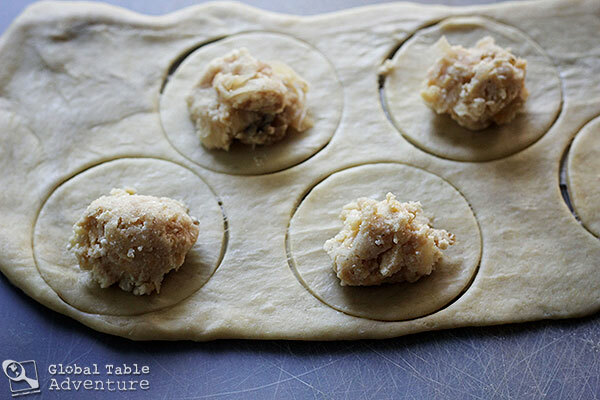 Roll out the dough, then cut circles and top with a dollop of potato filling. Pull the dough around the filling and pinch together at the top, then work around the edges. You might find it easier to work with less filling at first, but try to gradually work up to nice, plump pierogi. The dough should be elastic enough to do so. You can either freeze them or boil right away. Simply cook until floating and the dough is cooked through – this only took about 3-5 minutes for me, but will depend on how thick your roll out your dough. Drain and brown in butter. (Optional: add onions to the pan first and caramelize for about 15 minutes). Serve with a dollop of sour cream. I just happened across your site by way of Pioneer Woman. 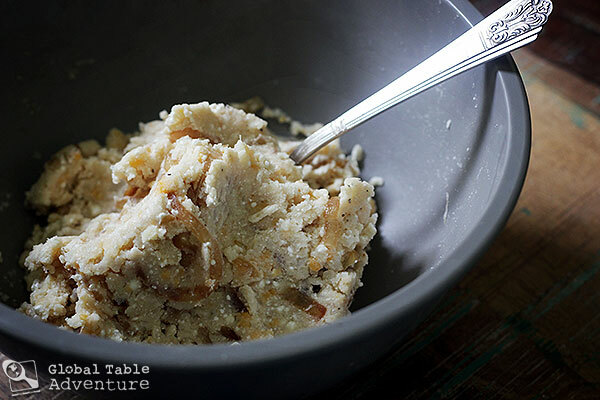 This post makes me want to put on a big read skirt, dance a little, and make some perogis! Thanks for the great post! So close yet so far! The business of our lives, can’t believe we haven’t had a chance to meet up, least I connect by looking at your site. I need to try making pierogies once in my life. This might very well be my favorite post of yours!!!! Awesome! The photos, recipe, everything! And, I have the exact same dish, except that it’s not heart-shaped, but it’s the same size and pattern. It is oval shaped. I love it. it’s a good thing cuteness doesn’t pay taxes or your daughter would make you and your husband go broke! Aww, moms are the best! 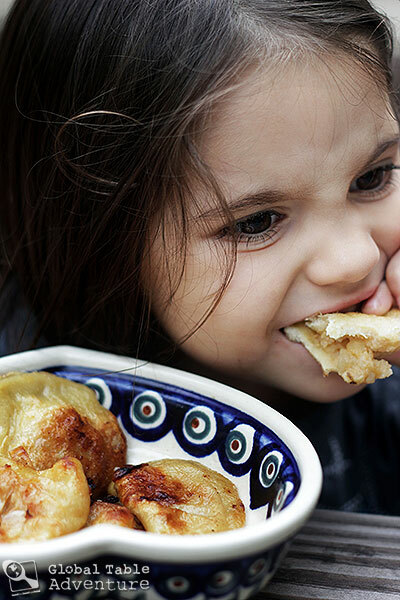 Your pierogi look amazing — just like the ones my grandma, mom, and aunts make every year for Christmas. It’s been a family tradition for as long as I remember for them to get together and assemble dozens of pierogi, some filled with cheese and potato and some filled with sauerkraut. They’re amazing. 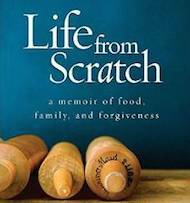 My grandma used to also make extra dough, because leftover dough can be cut into little chunks and boiled. Served with butter, they make the most delightful and comforting bowl of chewy noodles ever. I love traditions like this 🙂 And I love the tip for using leftover dough! Sounds great 🙂 Say hello for me! Those look amazing! 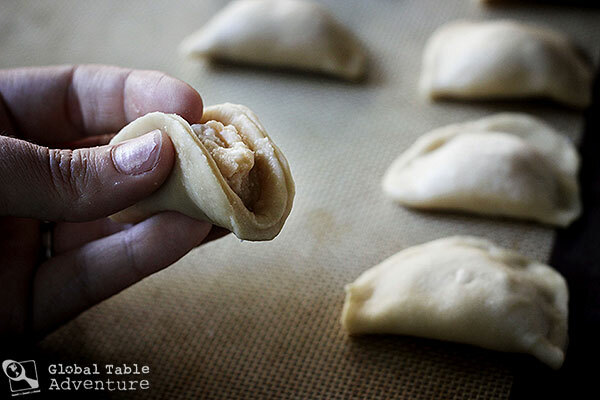 I used to make pierogi all the time for my family before I went gluten-free (haven’t quite figured out a good gluten-free dough yet), but my favorite recipes always used sour cream in the dough… it seemed to help the texture. My favorite filling growing up was farmer’s cheese seasoned with salt and pepper. They were a favorite breakfast when fried in butter and topped with jam. Yum! If anybody is looking to buy authentic pierogi, Millie’s is the way to go- they’re so good! 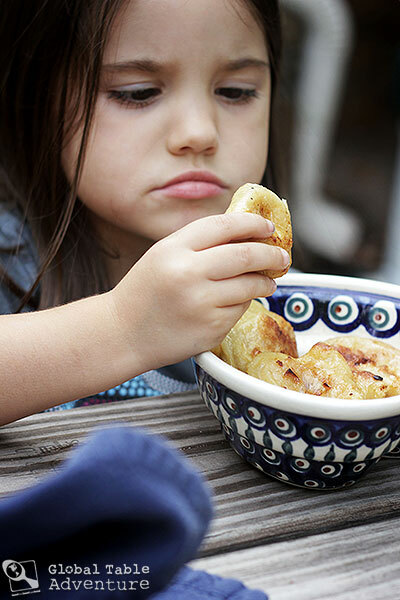 Pierogies are my daughter’s all-time favourite (in fact, we can usually convince her to try new foods by calling them something related – like dumplings are “dumpling pierogies”, and scalloped potatoes are “pierogy slices”). I’ve always used the frozen ones from the grocery, but if this is how easy they are, I may just have to try making them from scratch! I love this! I’m glad I’m not the only one who comes up with tricky ways to get my child to brave a new food haha. I also love to see our traditional Polish pottery from Bolesławiec is quite popular in US. I love it too. 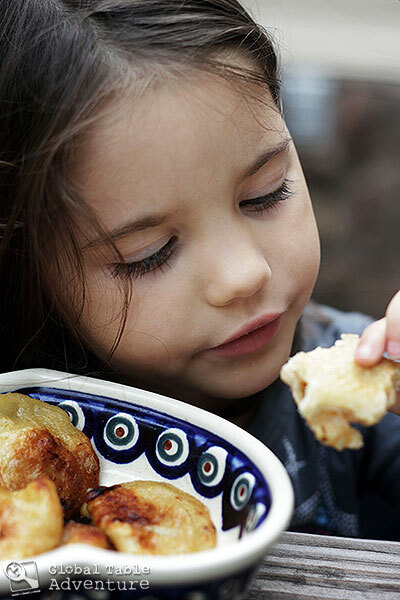 Ola, it was adapted from The Best International Recipe – I’ll be sure to note that the farmer’s cheese is the more traditional, so they can go with 100% that instead. 🙂 Thanks for your notes – it really helps with authenticity… I’m always seeking to learn the best approach. Can I ask what might be an obvious question – what is farmers cheese? I don’t live in the States, so what would I look for elsewhere? Thanks! What she calls “farmers’ cheese” is called “twaróg” in Polish. I’ve never seen it in the US. It’s a wet, white cheese with a consistency between ricotta and cottage cheese, but with a different taste. 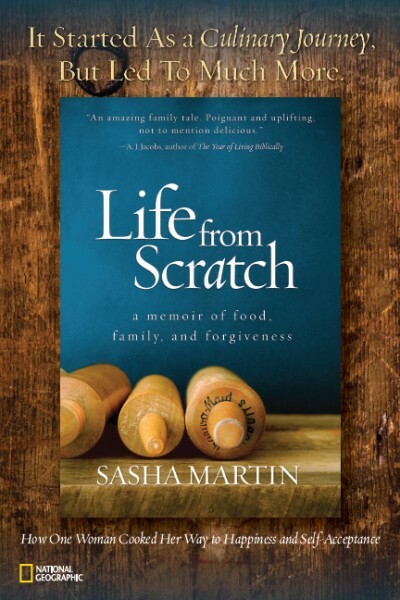 After it’s been cooked to high temperatures, it loses its aftertaste, and can be used in many sweet dishes (sweet pierogi, crepes, cheescake, etc.). I’m not sure whether you can find it in your country, but perhaps you could try mixing different cheeses together til you find a combination you like. When I was in the US, I couldn’t find twaróg, so I made “pierogi American-style,” which involved corn, chicken, peas, cheese… basically whatever I wanted. Thanks Rebeka – I found farmer’s cheese at Whole Foods, actually – and it’s exactly as you say – a consistency between ricotta and cottage cheese. Very mild and wonderful! I live in southeastern Pennsylvania and Farmers Cheese is widely available at farmers markets and grocery stores. I know Redners Markets for sure carries it. My father in law is Polish and they always make the pierogies with a cottage cheese and green onion filling. Your heart shaped bowl reminds me of the ceramics that we saw on a market in Jelenia Gora this summer ! 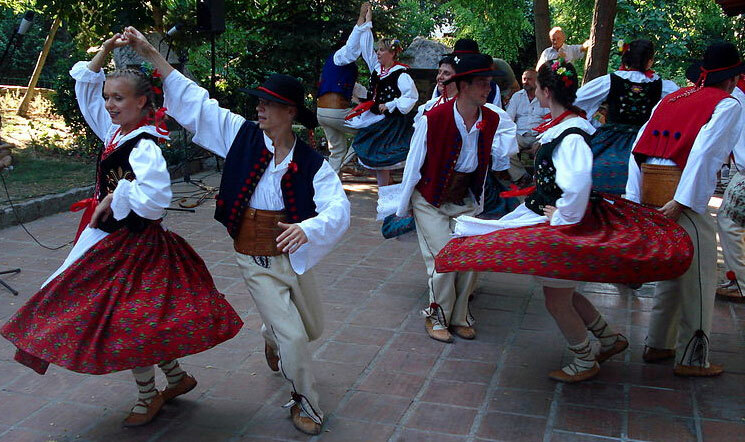 We were told that it’s typical of a village specifically – Boleslawiec (thanks Ola). So great that your mom sent it just in time ! It makes my heart happy to see traditions carried on. My son, the chef, and family will be visiting soon, and his part-Polish wife requested that we make perogi. As the chef is 50% Polish, I figure we can muddle through together. I (100%, 2nd generation) have made perogi exactly twice in my ….hmmm…..years. I know my filling is good as I did make them for a couple of Polish exchange students a few years ago and they said they were like homemade. Our family used/uses diced onion, carmelized, sour cream and cottage cheese in the potatos, as well as a healthy amount of salt and pepper. We use a basic egg, flour, salt and water dough. The only negative comment was they were too big — about 4″ long. 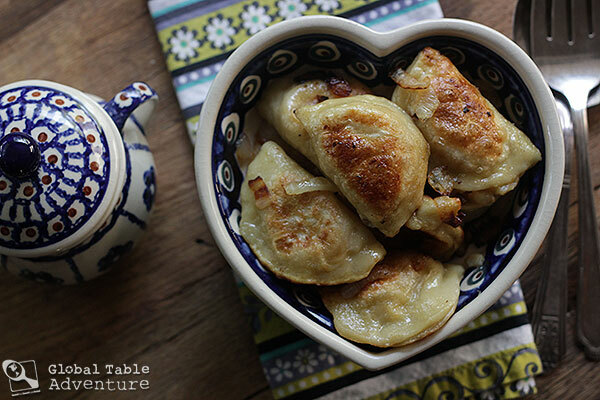 I also love the Bolslawiec Pottery and find it on occasion at Marshalls or TJ Maxx. 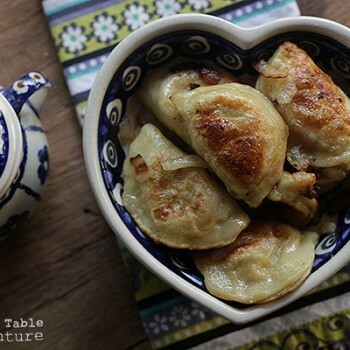 Im not big fan of pierogi with cheese and potatoes, prefer with sour cabbage and mushrooms 🙂 your look amazing and recipe is great. Btw all those beautifull plates are from Bolesławiec and they are very expensive. I wanted to make pierogis for Easter this year and I cam across your recipe. They look delicious! Just one question: How did you get the brown color on the outside of the pierogis? Did you fry them after you boiled them? Thanks! Looking forward to trying them! Yes, just fry them in oil or butter with the cooked onions. Saw this on Pinterest, thanks for sharing! p.s, your little one is adorable!